A database is a collection of information / data that is organized so that it can easily be retrieved, administrated and updated. Databases thereby enable the opportunity to create dynamic websites with large amounts of information. For example, all data on members of HTML.net and all posts in the forums are stored in databases. There are many different databases: MySQL, MS Access, MS SQL Server, Oracle SQL Server and many others. In this tutorial, we will use the MySQL database. MySQL is the natural place to start when you want to use databases in PHP. If you have a hosted website with PHP, MySQL is probably already installed on the server. Read more at your web host's support pages. If you have installed PHP on your computer yourself and have the courage to install MySQL as well, it can be downloaded in a free version (MySQL Community Edition) at the MySQL's website. In the rest of this lesson, we will look more closely at how you connect to your database server, before we learn to create databases and retrieve and update data in the following sessions. Pretty straightforward: First, you write the location of the database (server), and then type in the username and password. If you have your own website, you should read about location of your MySQL server on your host's support pages. Username and password will often be the same as those you use for FTP access. Otherwise contact your provider. In the examples are added or die(mysql_error()) which, in brief, interrupts the script and writes the error if the connection fails. 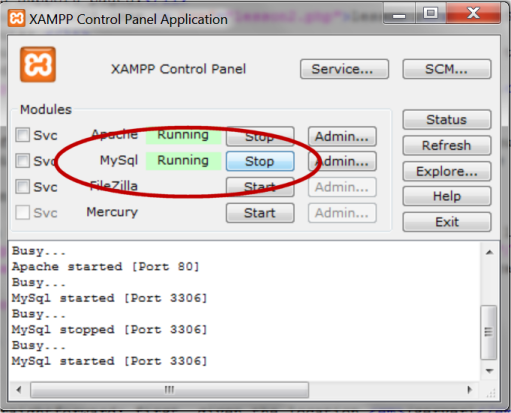 Now we have made a connection to a MySQL server, and can now start creating databases and retrieve and insert data. This is exactly what we will look at in the next lessons. By the way, keep in mind that it is good practice to close the database connection again when you're finished retrieving or updating data. This is done with the function mysql_close.